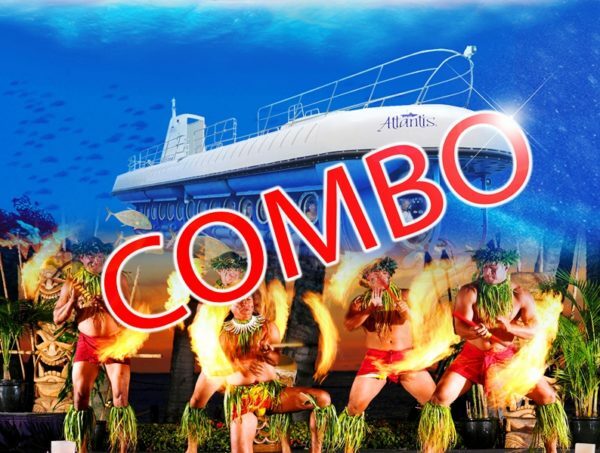 Maui Submarine Adventure & Royal Lahaina Luau – experience a fabulous submarine adventure and the popular ocean-front luau with lei greeting, traditional imu ceremony, an all-you-can-eat Hawaiian luau buffet and open bar! About Maui Submarine: Maui Submarine Tour Adventure is the biggest attraction on Maui is more than 100 ft. below the ocean. Maui Submarines is your ticket to see it. Take an once-in-a-lifetime undersea adventure in an Maui Submarine, the world’s first and most technologically advanced passenger submarine. You will journey into a spectacular blue world more than 100 feet below the surface in spacious air-conditioned comfort. To enhance its sub tour experience and help improve the marine environment, Submarine Tour Adventure embarked on creating an artificial reef in December 2005 by sinking the aged Carthaginian replica of a 19th century supply vessel. The sunken Carthaginian, which needed major repairs and would have been scuttled at sea otherwise, is anchored to a sandy bottom in 95 feet of water that is devoid of coral reef. The resulting artificial reef will develop into a self-sustaining habitat for indigenous fish, coral and other marine life. Join us aboard the Submarine Tour Adventure in Maui to witness the new resting home of the Carthaginian. Operates: Sunday to Friday, from 9:00 am, 10:00 am, 11:00 am, 12:00 pm, 1:00 pm and 2:00 pm – check-in 30 min prior to submarine departure time. 6:00 pm for Luau. Duration: Submarine tour time is 1 hour and 45 minutes. Actual underwater tour time is 45 minutes. Up to 2 hours for Luau. Inclusions: 10 min boat ride to and from the Submarine which is kept off shore. Underwater time is approx 45 min with full experience approx 1.45 hrs, plus all above Luau inclusions.